My entry didn't turn out as I had envisioned it this week (and now I can't even remember what I DID envision!) 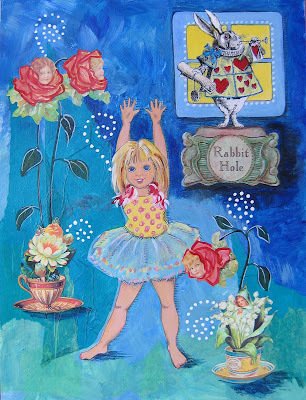 but here it is and I hope it conveys a sense of a modern little Alice's idea of Wonderland. I began by thinking of what Alice would be like if the story were written today, instead of the prim and proper 19th century Alice. I was pretty certain she would be wearing a tutu. And be a little more hyperactive. I used acrylic paint, colored pencils, and tissue paper. The white rabbit is transferred to the page from the illustration by John Tenniel. The flowers and teacups are collaged. And what do you know, they are from my "Tea Cups, Saucers, and Fairies" collage sheet! The final thing I did was 'paint the roses red' like the card gardeners in the story (wouldn't want the Queen to have me beheaded). The roses were originally pink and yellow. Thanks to Elaine from ChatElaine Jewellery who gave me the idea of painting the roses after I saw her gorgeous red rose bead! Pop over to Inspiration Avenue Sunday afternoon to see all of the amazing entries in the Wonderland challenge. Can't say I have counted up all of the entries from previous challenges, but it seems to me we have a record number of entries this week! Oh wow what a fantastic wonderland. Wow Maggie, I love your submission for this week's challenge!! You've recaptured Alice with a modern feel perfectly and she's just darling!! Really gorgeous work and I think we all enjoyed the theme this week - thanks so much!! What a good idea - a very modern Alice indeed and yes, you're right, she would certainly be more hyperactive! I love this idea! A modern day illustrated Alice. Love all the element you used too. I'm skipping over to look at you teacup sheets. So cool! she is just adorable... she looks like she's daring to dive through the hole! great entry maggie!